Known as “The Polka Dot Girl” of World War II pinups, Chili Williams (born Marian Sorenson Uhlman on December 18, 1922) was discovered by a modeling agent in 1943 at Fire Island in New York. The modeling agent’s photographer, Ewing Krainin, took her picture while she was frolicking in the Atlantic Ocean surf, and a series of photos appeared in the September 27, 1943 issue of LIFE Magazine. Krainin had stitched together a black-and-white polka-dot dance-set (which would later come to be known as the “bikini”) for her. The photos were so well received, that 100,000 fans sent in letters requesting copies. The pinups eventually found their way into the hands of homesick GI’s fighting during the final phases of World War II. 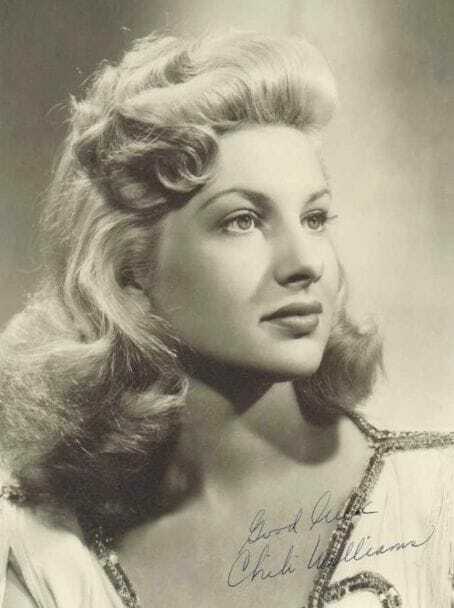 She signed a movie contract later in 1944 and moved to Hollywood, California, where she appeared appeared in 17 films, including the wartime favorites “Girl Rush” (1944), “The Falcon In Hollywood” (1944), “George White’s Scandals” (1945), “Johnny Angel” (1945), “Wonder Man” (1945), and “Having A Wonderful Crime” (1945). Chili died on October 17, 2003 in California.